Women of Color Shouldn’t Face So Many Hurdles to Leadership. Here’s What We Can All Do. This Op-Ed was originally published by The Chronicle of Philanthropy. To read the full article, please click below. Last month, a historic number of women of color were sworn into office in the U.S. Congress. Women of color now constitute roughly a third of the women in both legislative bodies. While we need to do far more to ensure that more women of color attain political leadership roles, this milestone forces us to put the spotlight on the track record of other parts of society, including the nonprofit world. A new analysis of a study conducted by Building Movement Project, called "Race to Lead," shows that women of color working in nonprofits experience persistent barriers to advancement and often work in environments that are unsupportive of their leadership. My colleagues and I began to notice this problem when we conducted research to understand the persistent racial leadership gap. In a study of 4,000 people, the findings demonstrated what many people of color at nonprofits already knew — it was racial bias, not education, experience, or skill that most held people of color back from the top jobs at nonprofits. As we looked more deeply, we recognized that the intersection of race and gender means women of color encounter systemic obstacles to their advancement over and above the barriers faced by white women and men of color. More than a third (36 percent) of women of color told us that their race had negatively affected their advancement, while 28 percent of men of color reported the same. Similarly, 30 percent of women of color reported that their gender had stymied their advancement, compared with one-quarter of white women. In write-in comments, women of color told us they were passed over for new jobs, promotions, and projects in favor of others — including men of color, white women, and white men — with comparable or even lower credentials. College and advanced degrees don’t always close the gap in promotions or pay. Although higher education is typically thought of as a key asset for workers striving to advance in their field, advanced degrees do not close gender and racial gaps in pay and position. We noted a racial and gender divide in our survey data — white men were at the top in terms of role, followed by men of color. Several percentage points down were white women and, finally, women of color. Women of color with advanced degrees were least likely to be in chief-executive or senior-management positions. Even more telling, they were more likely to be in administrative roles. "When the senior leadership identifies and grooms a colleague they think would be an impactful ‘face’ for this organization, that person is white, male, and heterosexual," wrote a black woman on the survey. "In one instance, I have far more experience and education, yet am not being groomed in this way." Women of color — even those in senior-leadership positions — also are paid significantly less compared with white men and men of color (but not white women) with comparable education. Women of color also more frequently report frustrations with inadequate salaries. As one survey respondent told us, "As the director of HR, and with over 20 years of experience, I was earning $20K-$30K less than white staff members that had only undergraduate degrees and seven years of work experience. Needless to say, I did not remain with that organization for very long." Women of color are often either ignored or tightly scrutinized. Many women said that they were ignored or invisible within organizations: They were less likely than others to receive internal mentors, feedback, and performance evaluations. In other situations, they were hypervisible: questioned about their decisions and confronted with negative stereotypes. For example, women of color in a variety of roles — from middle management to executive leadership — were asked to exhibit more "feminine" leadership styles and also critiqued for appearing assertive. 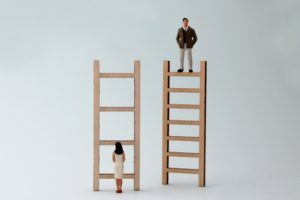 Some women were persistently stereotyped as less qualified, inexperienced, or unskilled — perceptions that the women felt were the result of both their race and their gender. "I have experience being not given that ongoing feedback but instead policed as a woman of color in a way that other staff members, be it white women or men, in general aren’t policed, a woman of color in our Raleigh, N.C., focus group told us. "Being questioned about certain aspects of my job that other folks are not questioned. ... It can be a little bit disheartening." Despite the challenges women face, many have the skill and ambition they need to lead nonprofits. Foundations and nonprofits play a role in removing obstacles to advancement and ensuring a fair and supportive environment for all workers, including women of color. Grant makers must commit more dollars and attention to organizations that advance women of color. Foundations have signaled that diversity is important by asking about the racial composition of staff and boards of organizations in grant proposals, but too often these diversity questions either ask about race and gender separately or fail to consider gender and gender identity at all. Adding more questions would force groups that seek grants to think harder about these issues. But that’s just the first step. Foundations like the NoVo Foundation and Ms. Foundation for Women are channeling more of their money these days to organizations led by women of color. Other grant makers should do the same — and ensure that more of their grants go to organizations that serve women of color as well as those led by them. Taking those steps will help elevate the leadership, perspective, and influence of women of color in the nonprofit world. Organizations can take internal steps to change. Nonprofits should focus on both conscious and so-called unconscious biases that affect the mentoring, feedback, evaluations, and overall treatment of women of color. Organizations also need robust policies that make clear that racism, sexism, and other biases will not be tolerated and ensure that people who violate those expectations face consequences. What’s more, nonprofits must pay women of color fairly and create transparency about pay scales so that people with similar credentials and experience don’t have to worry if they are similarly compensated. Create ways for women to support one another. Just one-third of women of color said they had access to a peer network to support them in their jobs, while nearly half of white men said they had gotten assistance from peers. Peers can be important mentors, but such relationships don’t take place by happenstance. Several industries have race- or gender-based affinity groups that encourage, support, and advocate for the inclusion and advancement of the constituency they represent, and those groups could serve as a model. That said, peer support should be seen as a supplement, not a substitute, for supervisors providing mentoring and increased grant investments in organizations led by women of color. The challenges facing our world demand that we embrace diverse talent to solve them. It takes all of us working together to make sure that women of color no longer face the barriers to leadership that mark the nonprofit world today. Ofronama Biu is senior research associate at Building Movement Project.